What Is a Matthew Party? In Luke 5:29, Matthew, also called Levi, invited his friends to a feast so that they could rub shoulders with Jesus. This was a party which could serve a kingdom purpose. A Matthew Party is a social event with both members of Mac as well as those of the community. These parties provide our family at Mac with a deliberate way to build relationships with others with whom we want to share Christ. These parties can take any creative form imaginable from having a group of friends over to play some games, celebrating holidays or birthdays, hosting a football or basketball night, dinner, tea or quilting parties. Matthew parties are a grassroot level opportunity to have fun while serving Christ. The office does not organize these or track them. They are a way for us to join together to reflect Christ to those around us. Among those professing to follow Christ, different studies have revealed that somewhere between 75% and 90% of those professing to follow Jesus were influenced by a relative or friend. In a society that is overwhelmed by mass media tending to ignore much of it and is slowly becoming more resistant to following Jesus, relationships are still an open door for evangelistically reaching others. Matthew parties provide our Mac family with a relationship tool so that we can work together drawing upon our various strengths in order to assist others in joining with us at Mac to serve Jesus. Matthew Parties are intended to be part of living out a mindset to live for Jesus everywhere we go. As we get to know people, they should realize we serve Christ. If they are interested in learning more, we invite them to join us for worship, provide biblical resources for them, or guide them into a Bible study. This should be true about us, not just at our parties, but wherever we might go. We need to use some social wisdom in deciding who to invite from our Mac family that could mix well with our neighbors, relatives, colleagues, and friends. Ideally, we want those we are trying to reach to outnumber those from Mac! How Do We Make Matthew Parties Evangelistic? We do not want to scare off our friends and relatives without giving them a good opportunity to understand. To assure this does not happen, here are some suggested steps in your relationships with those attending your Matthew Parties. 1) Socialize first. Allow others to see authentic Christian lives. 2) Shine the light. Early in the relationship casually let others know we serve Christ and worship at Mac. Some of us may mention an activity at church we participated in or which we are excited to attend. Others of us may say something like, "As someone trying to serve Christ, I think ..."
4) Share Jesus. When friends demonstrate interest in spiritual matters, we help them take the next step. This may involve inviting them to join us for worship, providing a biblical or spiritual resource or arranging for them to have a personal Bible study. Typically, the Matthew Party itself will consist of the first three steps. We have good clean fun. We casually mention going to church or something like how great God must be. If there is food, we could give thanks to God. At some point, we springboard off of a conversation to introduce a spiritual idea or topic. If our visitors want to talk about it, OK. If not, we do not force the topic, we wait for another time. In the relationship, when someone indicates an interest in spiritual matters whether it be on phone or in person, we help them take the next step. Maybe that is inviting them to join us for Bible study and worship. Maybe that is providing them good resources for study. Maybe that is setting up a time when their questions can be personally answered by yourself or with someone else. 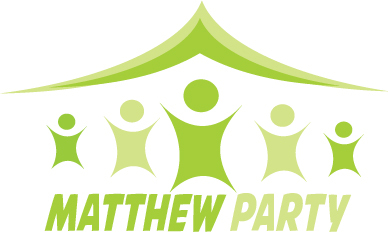 For more information about hosting a Matthew Party contact Barry Newton.